Check out one of the world's most famous early photos. It shows the Wright brothers and the 1st true airplane on December 17, 1903. This is a fun site where I receive daily science updates. Thanks for the reminder - UHH and Earth Sky News are the first things I read each morning. 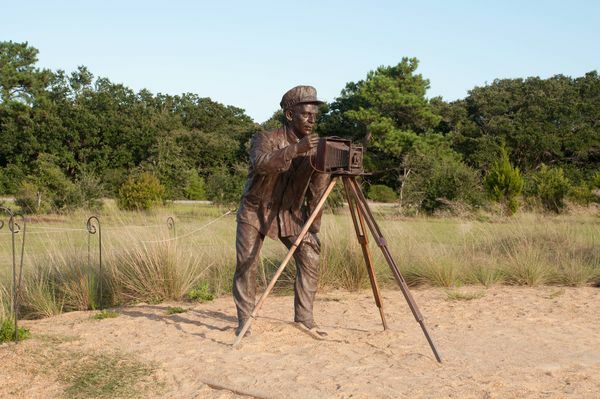 My photo, taken at Kitty Hawk, NC at the site of the flight, is that of a statue of the photographer who captured that immortal moment! Despite the fact that these men were not formally educated , they were aeronautical geniuses . Not only did they find a way to control their powered machine in the air , they are the actual inventors of the wind-tunnel and air screw propeller . Wing warping of course led to the invention of the aileron . If anybody wants a great insight into the Wright brothers, try David McCollough's book The Wright Brothers...I found it to be a great read! Cool image. 1903. Wow, it was shot on a glass negative (wet plate perhaps? ), notice the missing BL corner.